“Dallas” fans know who killed J.R. and what happened to Pam, but one question remains unanswered: Will TNT renew the show for a third season? To help the good people at TNT make up their minds, here are 10 good reasons to give “Dallas” another year. 10. 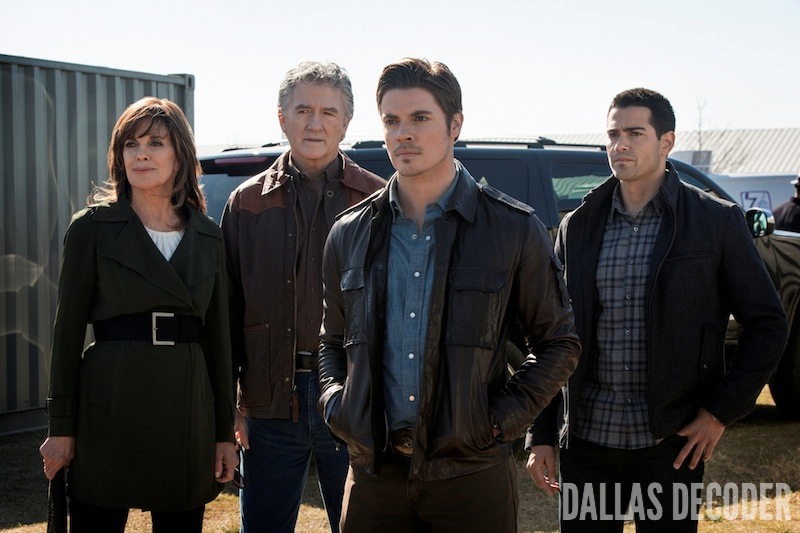 “Dallas” is TNT’s most-watched show (right now). TNT showed four original series this winter and spring: “Dallas,” the medical melodrama “Monday Mornings” and the cop shows “Southland” and “Boston’s Finest.” The “Dallas” telecasts averaged 2.7 million viewers, more than twice as many as any of the other shows. When you count DVR users who record “Dallas” and watch each episode within three days, the Ewings’ weekly audience rose to 3.5 million viewers. Now chew on this: the CW’s “Hart of Dixie” and “Beauty and the Beast” each average 1.5 million viewers per episode – and both shows just got renewed. What are you waiting for, TNT? 9. Creatively, “Dallas” is on a roll. This show hit its stride in Season 2. The stories honored the classic “Dallas” themes, but with fun, fresh twists. “The Furious and the Fast” was like one of the old show’s Ewing Rodeo episodes, but with racecars instead of bucking broncos. “Who Killed J.R.?” echoed the most famous “Dallas” storyline of all time, but it was an even richer, more complex mystery. The new series has also expanded the “Dallas” universe by adding two more feuding families: the poor, proud Ramoses and the weird, wacky Rylands. The names may be new, but the conflicts – ambition, greed, lust – are “Dallas” all the way. 8. Critics love it. “Dallas” isn’t just adored by its fans; critics go gaga for the Ewings too. Season 2 scored an impressive “82” on Metacritic, which makes “Dallas” one of TV’s 10 best shows, according to the website. Variety’s hard-to-please critic Brian Lowry wrote the second-season opener “[clicks] on all cylinders, with plenty of bed-hopping, two-timing and Texas-sized dealmaking to go around.” In Entertainment Weekly, Henry Goldblatt praised the storytelling (“the plots are twistier than a fishtail braid”), while Jessica Shaw predicted viewers who watched “J.R.’s Masterpiece” would “shed enough tears to fill the TV legend’s ten-gallon hat.” She wasn’t kidding. 7. “Dallas” has something for everyone. Every Monday, I watch “Dallas” with the Twitterverse, where the kids swoon over hunks like Josh Henderson and Kuno Becker. And every Tuesday, I get a call from my mom, who wants to dish about the previous night’s episode, which she watches with her retirement community neighbors (“That Patrick Duffy is still so handsome!”). But “Dallas” doesn’t just bridge the generation gap. I talk to a lot of “Dallas” fans, and I know: This show appeals as much to blue-staters as it does to red-staters. Heck, if we want to break the gridlock in Washington, maybe we ought to make the politicians sit down and watch “Dallas” together. 6. The merchandising potential is enormous. The people who make the new “Dallas” have figured out something the producers of the old show never fully grasped: Fans don’t just want to watch “Dallas;” they want to experience it. HSN sells “Dallas” clothing and J.R.-branded bourbon is on the way, but that’s just scratching the surface. How about a “Dallas” soundtrack with all the cool music featured on the show? What about a line of John Ross Ewing prophylactics? Or maybe some Ann Ewing tissues, for those times when you need a good cry? Take it from me, TNT: There’s a lot more money to be made off this show. It is the Ewing way, after all. 5. Two words: “Linda Gray.” No one shined brighter during “Dallas’s” second season than Linda Gray, who delivered one amazing performance after another. Sue Ellen lost the election, maneuvered her way into Ewing Energies, fell off the wagon, flirted with Gary and Ken and blackmailed the governor into doing her bidding. Whew! Make no mistake: Gray has become “Dallas’s” star attraction. In the Washington Post, Hank Stuever praised Gray for discovering “new depth as an older and much wiser Sue Ellen. She is this show’s version of a dowager countess, and any scene she’s in is immediately improved.” We agree. Her performance alone merits a third season. 4. Two more words: “Patrick Duffy.” Patrick Duffy arrived on our television screens in “The Man From Atlantis” in 1977 and he’s pretty much been entertaining us nonstop ever since. “Dallas.” “Step by Step.” “The Bold and the Beautiful.” “Dallas” again. Does TNT want to be the channel to break this 36-year streak? I’m betting it doesn’t. Like Gray, Duffy just gets better with age. On the new “Dallas,” Bobby is still the good guy we know and love, but he’s also kind of a badass. Did you see that slow-mo walk he took after he set up Cliff Barnes in “Love and Family”? Bobby deserves another season to show us how friggin’ cool he is. 3. The rest of the cast rocks too. Besides Gray and Duffy, the new “Dallas” has the best cast on television. Jordana Brewster consistently delivers smart, convincing performances as Elena, Julie Gonzalo and Henderson are slyly charming as Pamela and John Ross, and as Christopher and Ann, Jesse Metcalfe and Brenda Strong are the best criers in prime time. “Dallas” is also the destination for television’s best guest stars. In Season 2, we got Judith Light as loony Judith Ryland, Lee Majors as dashing Ken Richards and Steven Weber as smirktastic Governor Sam McConaughey. Aren’t you eager to see who’ll show up next year? 2. “Dallas” is part of TNT’s history. In 1991, when TNT was three years old, the cable channel added “Dallas” reruns to its lineup and held a contest inviting fans to submit lyrics to the famous theme music. The winner: Brian McCullough, who I interviewed last year. His lyrics: “Oh we own this / And we own that / As far as the eye can see! / From Texas soil / We pump Ewing Oil / Daddy Jock, brother Bobby / And me! / Yes, I’m J.R. / I’m known near and far / A rat in a town / That’s cat-free! / I make big deals / And I’ve got one that’s real / Merging “Dallas” with TNT!” See, TNT? “Dallas” is your heritage. And if the Ewings have taught us anything, it’s the importance of being true to your roots. I believe TNT will renew Dallas for another season, although it might be only a 9-episode season to see how the show does without J.R. I think the network can see Dallas just isn’t anywhere near as good without Larry Hagman’s legendary portrayal of the Texas oilman. Gray should be given a much larger role in Dallas. Here’s one suggestion: The Texas Supreme Court rules there was fraud in the last gubernatorial election and orders another vote. This time, Sue Ellen wins! Multiple story lines could flow from that. I’d like to see a little larger role for Patrick Duffy as well. In addition, John Ross needs to develop as a more interesting character with more than just one dimension. It’s a tall order for Dallas to survive without J.R., but I think TNT would like to give the show a chance. The lowest number of episodes the show can do under its tax arrangement with the city of Dallas for filming there (which runs through season 7) is 13. So any renewal is going to be at least 13 episodes. I live in Dallas. The deal was rather well publicized here. Dallas City Coucil will pay the Dallas production crew $200,000 a year as long as they film in Dallas up to a certain number of seasons. The minimum of 13 episodes thing is mentioned here, as well as some other facts, like the budget for each Season 1 episode was about $1.2 Million dollars. The deal was struck before Season 1 aired, but after it was made. It was announced to the public on June 4, 2012, which was RIGHT before the premiere of Season 1. I’m pretty sure Season 2 was the first under this deal. That link also has a link to the Youtube version of the Title sequence that includes the Texas Rangers baseball team in the flyover. I wondered why that got taken out, to be honest. It also includes the traditional “in alphabetical order” from the old show. Thanks to Joe, our man in Big D! I’d never seen that initial cut of the opening credits before. I have to say I like it better than what we have. As a baseball man I like seeing the Ballpark and the show has made a huge mistake not giving the cast in alphabetical order. I kind of wish the new show had preserved the alphabetical order tradition too, Dan. I do not know if i said this on here before, but I think is season three they should play the Larry Hagman “Previously on Dallas” it would be like JR is watching over them and knows all. Brandon, I love the idea of using Larry’s voice each week. Brilliant suggestion. Thanks. Great info, Josh. Many thanks. This begs the question: Of the viewers the new show has what is the breakdown between fans of the old show and people watching for the first time with this new series? If there are more new fans than old fans then the loss of Hagman shouldn’t matter. But even if they are all old fans the 2.7 million average for this season are likely the fans that will watch this show even if it is became crap on a cracker. We all have our obvious attachment to the old characters, but deep down we all recognize the new actors are the long term future of the show. The old actors are the transitional bridge and hopefully will be with us as long as he show lasts but the stories have to revolve around the next generation. TNT may wonder if “the next generation” of the Dallas cast has what it takes to stand on its own two feet without Larry Hagman. The network will probably give the show a limited chance with a very low number of episodes ordered for Season #3. Don’t get me wrong guys. I loved Hagman. He was the only reason to watch Dallas when it got mostly crappy in the last couple of seasons, really. His presence will be missed. I’m just realistic. His appearances in Season 2 outside of the first couple of episodes was mostly not there. The show was already being carried by others even when he was still on the show. Heck, I’d even consider getting a bottle of that JR Bourbon – even though I don’t drink the stuff. Love the character, and Hagman seemed pretty cool himself. I just think with him gone, the others have already shown they can carry the torch. The character of John Ross was seriously ramped up in Season 2. He was not the same character that he was in Season 1. I think that was intentional. My guess is the long term plan was for JR to ease John Ross into this kind of stuff, but with Hagman obviously declining health wise in a hurry, I guess they moved it up. I could be completely wrong, but it’s what I thought several times during Season 2. I submit that’s already happened with Season 2. Lets face it. If you total up the amount of face time that Hagman had in Season 2, it was fairly minimal. Most of his last couple of episodes were just him with one other person. While the CHARACTER of JR Ewing towered over events, the actor did not. He was mostly withdrawn, and if you break down the actual drama of Season 2, Hagman wasn’t in it much, except the first two episodes. After that, it was more about JR’s Reputation, and his Master plan – the overwhelming majority of it was dealt with by other people. I say the new people have already proven they can cut it without Hagman. Part of that is because of his death, they had to change the way the season went and even re-wrote and used old footage to create a lot of the face time he did have. Regardless, it is better than what they did with Jock in season 5 of the original, where Jim Davis was dead throughout the filming, but they kept his character alive and out of sight in South America for most of the season. I’ll second what Joe said. Hagman’s actual part was very minimum and yes the remaining cast did all the heavy lifting even before his departure. If these writers follow the template of the old show JR should continue to loom large for several seasons in the same way that Jock did. the whole team is great even without Hagman, the only one i don’t care for is Elana but the rest are bomb and their keeping the story line going just fine, so please keep them on or you’ll lose a lot of viewers on your station. Totally agree with you. Dallas is a must have for today’s TV. The programming today is so over-done with the reality shows “un-realist” stories and played-out themes, The original Dallas was one of the most favorable shows ever watched, and the new Dallas has brought us back to quality programming. real drama and real acting. Glad you like the show, Susan. Thanks for commenting! here is my reason: IT’S DALLAS! That’s as good a reason as any, Ronnie. Thanks. All 10 of the reasons that were listed are ones I completely agree with, especially because Larry Hagman would want the show to continue and all the actors are brilliant. I definitely want to see more Patrick and Linda also.! I would be very shocked if there was no season 3. The right people are there. the only worry I have is that one of the main characters holds out for more money or something lame like that. I would be shocked if there wasn’t a Season 3 myself. it’s Dallas, after all, but one thing that Cynthia Cidre has gotten exactly right is the respect for the Dallas history without all the crazy shenanigans that the writers were allowed to get away with in the latter portions of Dallas after Victoria Principal left the series. One thing I’d enjoy if TNT were to renew Dallas is a merchandising and promotional push (more than they’ve gotten thus far when the show is actually AIRING). I agree, BJ. More merchandise and promotion in Season 3, please! This was an awesome read…with #1 being the BEST reason! Hopefully TNT has a copy of this and delivers with an answer! Enough already! I agree, probably my favorite show on right now. I remember Dallas as a kid and my parents watching it, as an adult it helps to bridge that generation gap while providing entertainment. So much so that my wife and I have gone back to watching all the original Dallas episodes. It gives enough reference to the original series to peak the interest in having those of us who where 80’s babies want to see what we missed and/or didn’t catch all those years ago. To watch all the original shows cost money too, so add that to the list of merchandising that TNT could and would profit from. My thoughts are they will renew it. I also think that if it wasn’t in competition with some of the top prime-time shows it’s viewership with increase even more! Justin, it’s great that you’ve gone back to re-watch the original series. It’s fun to see the show through adult eyes now, isn’t it? you forgot mitch pileggi as harris..what a great actor!! Great point, Sterling. You’re correct: Mr. Pileggi is terrific. So is Emma Bell and the other regular cast members I failed to mention. I’ll show them some love in my next post coming later tonight. There was some branding going on with the old Dallas. I remember clearly getting a Dallas board game for Christmas. My parents returned it after our failed first attempt to play the game and finding that it definitely was a game for “adults”. That’s funny, Patti. I’ve seen that old board game on eBay. Now I want to buy one! “How about a “Dallas” soundtrack with all the cool music featured on the show? Yes, please! In my attempt to find “Liar” on the internet all I found were other people doing the same thing. And of course, I vote yes for season three as well. I love those character too, Linda. Thanks for commenting! I’d love to see Pamela and John Ross have a baby so the Jock Ewing/Digger Barnes feud will have come full circle. Only if Elena drops that as a nickname. Seriously this show needs do a little less name recycling only because it makes talk on these discussion boards a bit hard to follow at times. Dan, I agree about Elena’s name. The Pam/Pamela thing is confusing enough. Oh yeah, I think you’re right Brandon. It’s good news but it sounds like it is going to be a long wait… I was hoping for fall. Hopefully it’ll be worth the wait, Dan. Happy, Happy, Happy Dallas Day!!!!! It is renewed for the 3rd Season! YESSSSSSSS!!!!! We get more Dallas! More Sue Ellen, Bobby, John Ross, Chris, Ann, Pamela, Elena, Harris, Emma, Drew and Cliff! YEAAAAAAAA! I am doing the happy dance! Very Happy Dance! And…I liked the comment that JR will continue to loom large over the show! Chris B. is most likely the role model for the Dallas TNT PR Team!!! Jump, I don’t know about me being a role model for anybody…. Ha ha, Dan. If only! I have just been dancing in my street as just heard the news. Brilliant brilliant brilliant. Dallas mad since the age of 12 (1978). You’re an original fan, Steve! That’s very cool. Dallas needs to be renewed….and TNT should be rerunning the old episodes all summer….that would generate new watchers and stimulate new sales…. I am so disappointed this is one of the few shows I watch! Why would you cancel this?!!!! Listen to the viewers Renew Dallas! ! I am a big Dallas fan. I watched all the old ones more then once. I enjoyed watching the new ones too. Please don’t get rid of it. I want to see if Elena is having Christopher’s baby since they were only jumping 6 months when it was coming back. Please don’t cancel it is about the only family show left. Please do not take Dallas off the air!!!!!!! Please tnt keep dallas going. I’m 57 and been a dallas fan since the 80’s. I love the 2nd generation of the show. We are the age that spend money with your sponsors. Don’t let me best show go by the wayside. Dallas needs to continue on!!!! Monday nights will not be the same without it. TNT is crazy not to have picked up the show for another season……. #SaveDallas, I love this show!! I watch faithfully every week, never miss an episode! My mom and I talk every Monday, directly after the episode, we spend an hour discussing the show. The next day, I discuss with Coworkers! My ring tone on my phone is Dallas, I have always hummed the beginning of each episode( even on the original series). I’m in shock that this show won’t be renewed by TNT!! This show is better than anything else on right now! !